In 1983, Journal of Communication (JoC) published the special issue “Ferment in the Field” (Volume 33, Issue 3, co-edited by George Gerbner and Marsha Siefert). The issue focused on “questions about the role of communications scholars and researchers, and of the discipline as a whole, in society” (Gerbner & Siefert, 1983, p. 4). The 35 contributions reflected “on the state of communications research today; the relationship of the researcher to science, society, and policy; the goals of research with respect to social issues and social structure; and the tactics and strategies for reaching their goals” (ibid). In 1993, two comparable JoC issues were dedicated to “The Disciplinary Status of Communication Research” (Volume 43, Issues 3-4, co-edited by Mark Levy and Michael Gurevitch). In 2008, a JoC special issue discussed “Epistemological and Disciplinary Intersections” (Volume 58, Issue 4, edited by Michael Pfau). * What does the field of communication research look like? * What have been the key tendencies and developments in communication(s) research and its subfields? * How has the field developed in the past decades? What have been long-term continuities and discontinuities since the 1980s? * What is the actual and desirable role for communication studies in contemporary academe and society? * What is the status of theory, methods, critique, ethics, and interdisciplinarity in our field? * What is the status of critical research and theories? * How should the field position itself vis-à-vis key contemporary processes and challenges? * What does the future of communication studies look like? 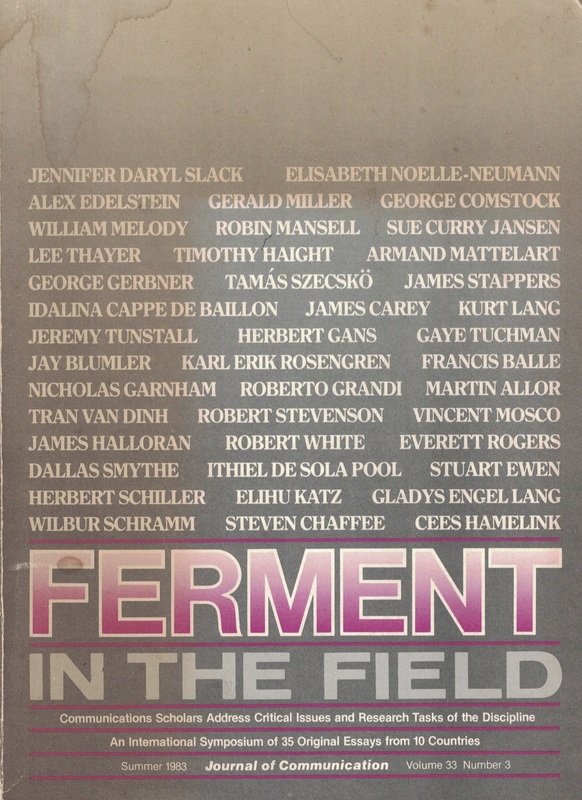 Contributions to a new edition of “Ferments in the Field” should be provocative essays that offer bold ideas with broad implications for the field as a whole and areas of specializations. This special issue speaks of ferments in the plural in order to spur reflections beyond established academic boundaries and stimulate discussions that encourage scholars to think beyond comfort zones. From multiple theoretical, methodological, and disciplinary perspectives, it asks about the continuities and discontinuities in communication research in an attempt to initiate a new round of debates about the past, present and futures of the field. The special issue will be published in 2018. The editors are Professor Christian Fuchs (University of Westminster) and Professor Jack Qiu (Chinese University of Hong Kong). Authors are welcome to submit extended abstracts to the Editors by December 1, 2016. Extended abstracts should have a length of 400-1,000 words (excluding tables, figures, and references). Abstracts should be submitted to c.fuchs@westminster.ac.uk and jacklqiu@cuhk.edu.hk. Subsequently, authors who were asked to submit complete papers will need to submit their manuscripts by May 2, 2017. Each manuscript should not exceed 4,000 words (including tables, figures, and references).